IBF super-bantamweight champion Carl Frampton has not yet agreed a deal to fight Scott Quigg, despite mounting speculation about a February bout. Newspaper reports claim the duo will box in Manchester on 27 February 2016. Negotiations are ongoing but Frampton's manager Barry McGuigan confirmed his team have not yet finalised details with the WBA title holder. "At this stage nothing has been signed but we are all working very hard to get this across the line," he told BBC NI. Frampton secured a points win over Alejandro Gonzalez in his last title defence in July, while Bury boxer Quigg defeated Kiko Martinez in the same month. There was speculation that Frampton would be in pre-Christmas action but confirmation of a spring meeting with Quigg appears most likely, once finances and a venue have been agreed. The IBF has confirmed that no paperwork has yet been received for the bout. 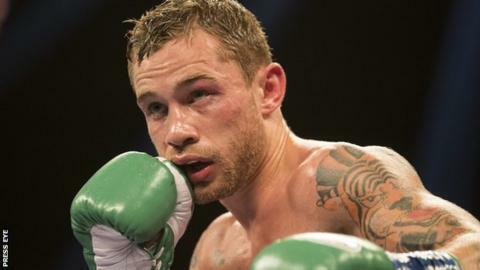 "It's the fight which whets my appetite the most," Frampton said in September. "I would be happy to fight him anywhere but is it fair for the champion to travel to Manchester to fight the challenger? I don't think it is. "I'm happy to go somewhere neutral, maybe London or Birmingham. "I don't think we are going to push for Belfast because I don't think he would come here."